The dissident "Catholic bishop" Richard Williamson is back in the news this week. 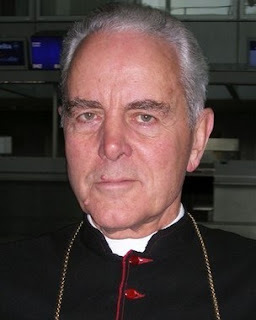 A prominent group of European rabbis has called on the Vatican to suspend negotiations with the Society of Saint Pius X, the ultra-traditionalist group of which Williamson is a senior member, after he used his blog to repeat the ancient charge that the Jews were responsible for killing Christ. Rabbi Pinchas Goldschmidt demanded that the SSPX show "a clear commitment to tackling anti-Semitism within their ranks." The "bishop" will be no doubt be delighted to hear that his words have had their intended effect. Members of the SSPX -- followers of a French archbishop who split from the Roman Catholic Church forty years ago in protest against modernising tendencies such as using vernacular languages in the mass -- are renowned for their reactionary views. Some remain unpersuaded that the earth goes round the Sun, four centuries after Galileo was put on trial for heresy. Others have ideas that border on fascism. Williamson's notoriety (as longer-standing readers may recall) dates from a 2008 Swedish TV interview in which he denied the Holocaust and the existence of Nazi gas chambers. Unfortunately for the Pope, the Vatican had at the time just lifted excommunications on Williamson and other SSPX bishops, despite having being warned about his track-record. Benedict's relationship with the Jewish community has never quite recovered. Williamson was expelled from Argentina, where he had been running a seminary, and has rarely been seen since, though there are reports that he is living in Wimbledon. He has been prosecuted and fined in his absence by a German court for Holocaust denial. For the past three years the main contact with the outside world has been via his blog. I should explain about the blog, which used to be called "Dinoscopus". After the Swedish interview, and the furore that ensued, Dinoscopus went private. Until recently his weekly posts were distributed with the assistance of some of Williamson's American supporters and preceded with a message from the editor, usually taking the form of an appeal for funds. Then a few weeks ago, it was announced that henceforth the blog - now retitled "Eleison Comments" - would be distributed under the bishop's sole control. It's still subscription only, but the portal inviting readers is now publicly available. Even when mediated by an editor, Williamson's words often read like a parody of extreme reactionary conservatism. He once wrote, for example, that women who wore trousers were guilty of "an assault upon woman's womanhood" and represented "a deep-lying revolt against the order willed by God". Indeed, he went on, "today's feminism is intimately connected to witchcraft and satanism." He has also used his virtual pulpit to denounce The Sound of Music as "virtually pornographic", to compare modern Ireland unfavourably with Portugal in the days of Salazar's dictatorship and to blame the world financial crisis on (there will be no prizes for guessing) the Jews. Williamson is not wrong that for most of its existence -- up until the Second Vatican Council of the 1960s -- the Catholic church has taught that the Jews were responsible for the death of Christ. In so doing, it nurtured centuries of anti-Semitism in Europe, manifested in massacres, inquisitions and pogroms as well as the non-lethal discrimination that forced Jews to wear distinctive clothing and live in ghettoes. Catholic doctrine was not directly responsible for the Holocaust, but it's hard to imagine the Nazis fixing their particular hatred against the Jews without this historic backdrop. "How can the Pope let go of such ancient truths?" asks Williamson, noting that Pope Leo XII at the end of the 19th century was still referring to the Jews as "that race, once God’s chosen people... who called down upon themselves the Blood of the Saviour". One answer is that an idea's antiquity is not a very good criterion of truth. It was an ancient truth that the earth stood in the centre of the universe, an ancient truth that bleeding cured fever, an ancient truth that astrology works or that women are unfit for participation in public life. An appeal to "ancient truth" wouldn't get you very far, these days, in science, politics or many other areas of life. Only in religion, and perhaps in New Age mysticism, does "ancient truth" not sound entirely like an oxymoron. Pope Benedict is not, indeed, noted for his sympathy with many of the modernising tendencies that emerged in the Catholic Church in the wake of the second Vatican Council. Yet in the topsy-turvy world of Williamson and his supporters, Ratzinger isn't the arch-conservative of popular imagination, stubbornly holding the line against such modern evils as contraception, female ordination and married priests while plotting to bring back th Latin mass, but a dangerous radical, leading a perversion of the true faith which Williamson dubs "Newchurch". Williamson has not been involved in recent talks with Rome about returning the SSPX to the wider Catholic fold. He has not performed any public role since the events of 2008. But nor has the group disowned him. In his blogposts, he has regularly cautioned the SSPX leadership against closer ties with the Vatican. He appears to regard the discussions as some sort of trap. So he will not be disappointed to learn of the repercussions of his latest online ruminations. It's not beyond the bounds of possibility, indeed, that he did it on purpose. But it never ceases to amaze me that the Vatican wants to talk to any of these nasty, mad, thoroughly unChristian people.